1407 - Civil war breaks out in France between the Armagnacs and Burgundians. August 1415 - Henry V of England, taking advantage of the turmoil, invades and the Hundred Years War, that started in 1337, intensifies. 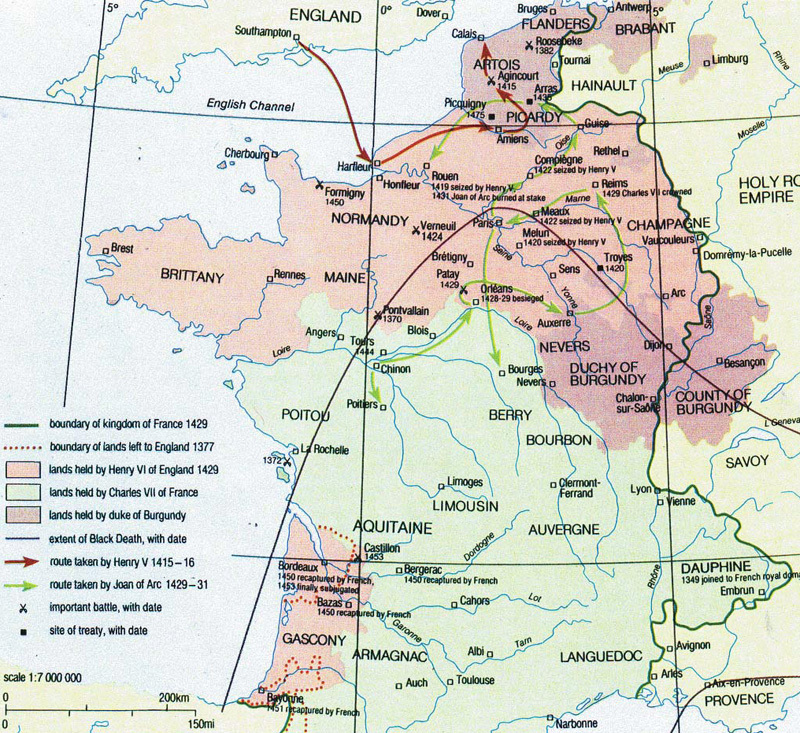 October 1415 - Battle of Agincourt, a catastrophic defeat for the French. (Centrepiece for Shakespeare's Henry V). 1424 - Joan begins to hear voices - those of St. Margaret, St. Catherine and the Archangel Michael. February 1429 - Joan travels on horseback and in male attire to the Dauphin's residence in Chinon to get support for her belief that she could recover her country from the foreign invaders. April 29, 1429 - In 9 days Joan raises the siege at Orléans, after the English had blockaded it for six months. This is a significant turning point in the Hundred Years War. July 16, 1429 - Joan leads the Dauphin to his coronation as Charles VII, at Reims. May 23, 1430 - Joan is captured by the French Burgundians and sold to the English for 10,000 gold coins. She was captured because she had assumed the place of honour in being the last to leave the field of battle. January 9, 1431 - Joan is put on trial for heresy and witchcraft in Rouen, seat of the English occupational government. May 30, 1431 - Joan is burned at the stake by the English. Her remains are thrown into the Seine. She was 19 years old. The Hundred Years War continues for a further 22 years after her death. June 1456 - Rehabilitated, found to be innocent and declared a martyr. April 18, 1909 - Beatified. May 16, 1920 - Canonized as a saint. Joan of Arc is the only person, ever recorded, to have, at 17, commanded the entire army of a nation. Dauphin - Under the Valois and Bourbon families in France the King's eldest son, heir to the throne. Orléans - Strategically placed on the River Loire as the final obstacle to an assault on the French heartland.